What a view! A warm welcome awaits amidst the cool coastal chic and luxury layout of Shoreline. 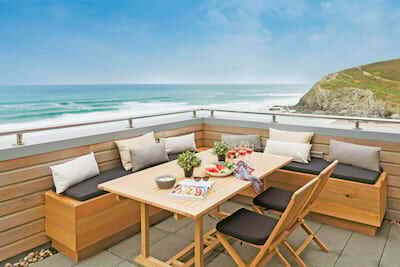 Aptly named, this stunning newly renovated penthouse sits in a wonderful elevated position high above the harbour and white sand beaches of St Ives, West Cornwall. An open plan layout of kitchen, dining and living areas offer ample space for all to relax and unwind whilst 3 boutique style bedrooms and 2 bathrooms complete the luxury ambiance. St Ives sets the scene for a quintessential holiday beside-the-sea and offers the perfect base be it summer stay or winter weekend. Enjoy the high life from Shoreline penthouse. Tucked away just off the harbour front, climb the stairs to the lofty living and stunning views. A staircase leads straight into the generous layout of the living room, dining area and modern kitchen. From the moment you arrive the natural light and unique sense of space fills the apartment with a wonderful holiday ambiance, the high vaulted ceiling evokes the traditional sail lofts of the local fishing heritage. The relaxed seating space has been thoughtfully mapped out to ensure the very best sea and harbour views in all seasons, hunker down and watch the wild Cornish weather or simply fold back the tri-fold doors and welcome the outside in. The dining table welcomes celebrations, lunch on the go or lazy summer suppers all prepared in the culinary inspiring kitchen - a chef's dream with cool white tiles and chunky wooden cabinets all set to the sea view backdrop. The bedrooms are located to the rear of the apartment, choose from the ensuite master bedroom with stylish furnishings and striking artwork or the twin bedded rooms each with unique colour palette and bespoke furniture. The family bathroom offers the perfect post beach pamper with deep bath and indulgent shower. Fold back the tri-fold doors from the living room for a bird's eye view of St Ives. A balcony stretches the length of the apartment with sit out chairs to watch the world go by. The views really are some of the best in the town as you gaze upon the characterful fishing boats, watch the tide creep in and out and follow the coastline seascapes up towards Godrevy Lighthouse and beyond. With the plum location in the town you really can live like the locals do and enjoy a relaxed pace of Cornish life, pop out for freshly brewed coffee and the morning papers, take a dip in the sea before breakfast or take an evening stroll along the sand. St Ives adds a cosmopolitan twist to the traditional harbour setting with tempting collection of restaurants, cafes and pubs. 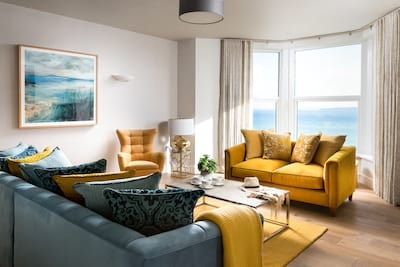 The West of Cornwall is ready to be explored taking in the stunning beaches of Porthminster and Porthmeor (just a short walk from your holiday door), Sennen, Godrevy, Porthcurno and many more. If sports are on the agenda then try your hand at surfing, sailing or kayaking perhaps or stretch your legs along some of the country's most beautiful coastal paths. Shoreline comes highly recommended to those looking for a luxury base with ease of access to harbour life. Stay in style for your next holiday with friends and family. The master bedroom has a skylight above the bed which has a blind fitted to it. Beautiful apartment with the best view in St. Ives. Would definitely visit Shoreline again. It was such a beautiful haven with fab views and privacy! This is a beautiful apartment. Spacious, light and had everything that we needed. The view over the harbour is absolutely stunning. Would recommend to anyone. Could not have a better location, wonderful. This was the cleanest apartment we have ever stayed in. We loved the apartment & enjoys a wonderful stay. This is a beautiful house with a stunning view, amazing light, well-equipped, and a central position in town. We loved it. Truly beautiful location and accomodation though my family loved it we will definitely return and use your company again. Thank you for a lovely holiday Cornish Gems . We really loved the apartment shoreline. We had a wonderful time in St. Ives. Very happy with the apartment. The view was spectacular and we enjoyed many G&Ts sitting on the sunny balcony taking in the view! Position within St Ives was excellent. The provision of windbreak and beach chairs was a nice touch and kitchen very well equipped. Perfect venue for a family hoilday. This property is presented in a truly stunning way. The decor and the facilities within were all top class, beautifully light and airey, very spacious even with 5 adults and an 8 year old. We spent hours on the balcony watching the tide and life go by. Drinking our tea and eating the saffron cake left for us by Cornish gems, a lovely welcoming touch. Long stay car park just a few minutes walk up a short hill. Local amenities including a pasty shop just a few steps away. If you are a lover of the dark, cold and glomey life this property isn't for you! 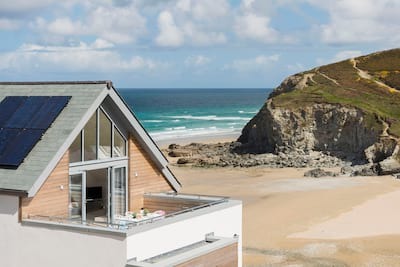 We would only stay here on our next visit to St Ives, thanks for Cornish gems and the owner of shoreline for introducing our 8 year old to Cornwall in such a fabulous and remberable way! Lovely view and position. Staff very friendly, had a great time and loved the view and decor and facilities brilliant. Really liked the soaps and bought some to take home.